Young Belgian rider Constant van Paesschen rode a sprint finish to rival Usain Bolt to win the CSI5* 1.45m speed class on the closing day of the Shanghai Longines Global Champions Tour. Riding the athletic Compadre van de Helle, the pair seemingly sprouted wings to soar to victory ahead of some breathtaking challenges from Marlon Modolo Zanotelli (BRA) and Karel Cox (BEL). “Compadre is a very competitive horse but if it’s spooky it’s not easy,” said van Paesschen ahead of his lap of honour. “He’s got better and better every day here and actually today when I came to ride him was the quietest he’s been but it’s paid off and I’m really happy with the horse. This is the fifth year the Tour has been welcomed in Asia and pulces raced under clear blue skies as 37 of the world’s best athletes lined up for a lightning quick battle. At the end of a competitive week here in Shanghai, the packed crowds, who turned out in their finery, were once again treated to some top notch sporting action and they loved every minute of it. Fans have been queuing patiently at the gate every morning and were also treated to a stunning shopping village and entertainment area with a European style feel. Course designer Uliano Vezzani set some daring angles and a tight turn to an offset Swedish oxer at fencc 8 caught out a few riders, while three sets of doubles on course required the utmost care from the horses. The final oxer over a water tray – a signature fence here in Shanghai — also dashed the hopes of many. The standard was set when Geir Gulliksen (NOR) and Exit Of Ice Z produced the first clear from second draw, much to the delight of the crowds. But rocketing through the start and powering down every line in top gear was Shane Breen (IRL), who always means business with the 12-year-old stallion Can Ya Makan, a big winner at the highest level. The pair set a mighty challenge and 66.14s was the time to beat. There were plenty of fireworks along the way but at this speed it was inevitable that the poles would start to fall and Gregory Wathelet (BEL), Philip Weishaupt (GER) and Christian Ahlmann (GER) were among those in the chasing pack who proved the time was beatable as they lit up the arena but with faults to add. It wasn’t until the midway point that the inevitable happened and the lead swapped hands as the ever skillful Karel Cox scorched round beautifully, surviving a couple of heart-wrenching rattles with the athletic nine-year-old gelding Evert to cruise into top spot in 65.56s. 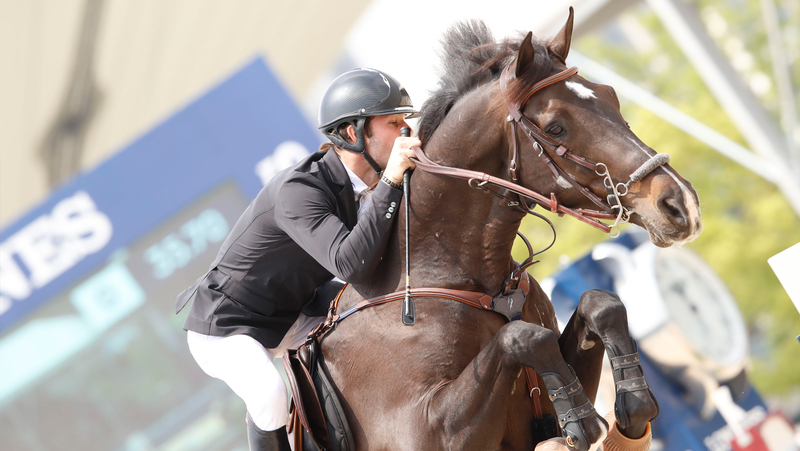 But electricity crackled as 24-year-old Constant van Paesschen (BEL) and Compadre Van De Helle entered the ring and the pair scorched round in a lovely rhythm to take the lead in a jaw-dropping time of 64.35s. The dust had barely settled before Marlon Modolo Zanotelli, a winner on the opening day here in Shanghai, blazed a trail on Rock’n Roll Semilly to slot into second place - just four hundredths of a second off the pace. Luck was on the side of the young Belgian rider, however, as his remaining rivals succumbed to the pressure and an outstanding victory was secured. The final class of the weekend, the Massimo Dutti trophy, will kick off in approximately 1 hour, tune in via GC TV and on Facebook live to watch all the action unfold, here in Shanghai.